You can explore the magical land of Oz from the comfort of your own home using the latest technology UNIT9. This Chrome experiment allows you to compose your own music, make your own movie using a zoetrope, and survive a tornado–if you make it through the tornado, you’ll be treated to a brand new clip from Disney’s Oz: The Great and Powerful! This new Chrome Experiment actually wouldn’t have been possible a few years ago; this 3D environment uses new technology called WebGL and CSS3. You can click the highlighted links if you’d like more information about the technology used. For this Chrome Experiment to work best for you, make sure you’re trying it out on an up-to-date computer because of the intensity of the graphics. If you’re a SmartPhone user, you can also check it out on your Android, iPhone, or iPad. 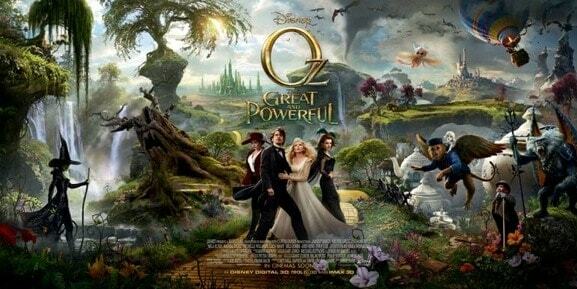 To get swept away to Oz, visit Find Your Way to Oz. I can’t wait to see the move! This movie looks amazing. we can’t wait to see it. WOW ! This new technology is amazing. I would love to have the kids express themselves in this way by composing their own music, etc. What a learning experience. They love 3-D movies anyway, and am hoping in the next year or so, to get a 3D TV for the home.. Enjoy your premiere. Huh, that sounds really interesting. Amazing how far technology has come along. This could be a lot of fun! Great post, i will have to check it out for my self. This was my favorite movie as a child. It will be great to watch with all the current technology updates. There is so much new technology out there today. This is really awesome! I hope the movie is everything promised and more! Fun, fun, fun!! After Avatar, I need some more techno-magic on the screen! I hope this turns out good.